The Al Mashaaer Al Mugaddassah Metro line, (Arabic: قطار المشاعر المقدسة الخط الجنوبي‎ qtar al mashaaer al muqaddassah al khat diljanubi) is a metro line in the city of Mecca, Saudi Arabia. Claimed to have the highest capacity of any metro in the world, it only operates for 7 days a year, and been used as an exclusive shuttle train for pilgrims between holy sites in Mecca, Mount Arafat, Muzdalifah and Mina to reduce congestion caused by thousands of buses and cars during the Hajj. The line was opened on November 13, 2010, in time for the Hajj 1431 between November 25–29, 2010. It was built separately from, and will not be physically linked to, the future Mecca Metro network. In peak periods the line operates with a special "group shuttle" schedule, better known as train movement "D", with three departure stations and three arrival stations. (At each holy site on the line there are three stations.) At off-peak times stopping-all-stations service is run. In March 2010, Serco Middle East was awarded a contract by China Railway Construction Corporation Limited (CRCC) to advise on the operation and maintenance of the Makkah Metro. CRCC had been awarded the design, build, operate and maintain contract in 2008 by the Ministry of Municipal and Rural Affairs. In November 2014, Metro project promoter Makkah Mass Rail Transit Co has selected Kuala Lumpur transport agency Prasarana to provide consultancy services during Phase 1 of the Makkah Public Transport Programme. Phase 1 covers the construction of two metro lines totalling 45·1 km and 22 stations, with commissioning scheduled by 2019. During the 2014 Hajj, staff from Prasarana and Express Rail Link helped to fulfil CRCC’s manpower requirement to support operations. Beginning 2018, the contract once again held by China Railway Construction Corporation Limited after 3 years operated by Prasarana Malaysia. The line was claimed to be the world's fastest design in the world, at 22 months, 16 months if religious habit is taken into consideration. It was initially operated at 35% capacity with automatic train protection to assist manual driving. China Railway Construction Corporation Limited was responsible for infrastructure construction and systems integration under the 6.7-billion-riyal phase I contract which was awarded by the Saudi Arabian government in February 2009 following a visit by President Hu Jintao of China. CRCC carried out construction of the project infrastructure and integrated and subcontracted various systems. The line was built in only 21 months by about 8,000 skilled and unskilled workers and approximately 5,000 engineers. DBI - Deutsche Bahn International GmbH - a fully owned subsidiary of DB Deutsche Bahn AG and DAR Dar Al Handasah were awarded with a contract from the Ministry of Municipalities and Rural Affairs of the Kingdom of Saudi Arabia to become the supervising engineers, responsible for Design, Construction, Railway Systems Implementation and Railway Operations until today. Several subcontracts were awarded. Al-Muruj Electromechanical Co. was awarded MEP works at all 9 stations. Siemens provided the overhead line catenary system supplied at 1500 V DC. Westinghouse Platform Screen Doors supplied the platforms with screen doors, Siemens power supplies, and WS Atkins is responsible for electrical and mechanical systems and project management. Thales supplied SelTrac Communications-Based Train Control, an operations control centre, CCTV, SCADA and passenger information systems. Systra supervised the civil work. Serco provides operations and maintenance consultancy. TÜV Rheinland were the Independent Competent Person (ICP) on the project and provided safety, operations, training, fire and systems assurance consultancy support including the development of System-Wide, O&M Safety Case and HSQE Management Systems. TÜV Rheinland also secured the Operating Licence and Safety Certificate for acceptance by the Saudi Railway Commission (SRC) in 2011, 2012 and 2013. Air conditioning solution was provided by SKM Sharjah, UAE. The line is elevated at a height varying between 8 metres (26 ft) and 10 metres (33 ft). Although the current metro uses conventional steel wheel on rail technology, it is sometimes incorrectly referred to as a 'monorail' due to cancellation on planned project in 2009. In November 2010 CRCC claimed they had lost 4.15 billion yuan (~US$600 million) on the US$1.77 billion contract due to changes insisted on by the client. The earthworks alone reportedly increased two-and-a-half times from 2 million cubic metres to 5 million. CRCC was seeking, with Chinese government support, extra compensation from the Saudi Arabian government to help cover the losses. On 4 April 2009 Changchun Railway Vehicles was awarded a contract to supply 17 Type A 12-car metro trainsets. Each set has eight motor and four trailer cars, all with aluminium bodies. A Type A car is 22.3 metres long and 3 metres wide. Knorr-Bremse supplied the braking systems with modifications to suit sandy conditions. The first trainset was shipped from China in May 2010 and the last arrived by the end of 2010. ^ The CRCC website says the trains have a capacity of 3,000 passengers (250 cars × 12 car trains) (http://meccametro.com/about-abu-dhabi-metro) but the analysis of the 2011 Hajj cites a figure of 3,600 passengers per train (12 × 300) and 30 trains per hour (120 second headway) (http://www.terrapinn.com/exhibition/middle-east-rail/Data/dr-salim-albostapart3.pdf). It is designed to transport 72,000 passengers per hour per direction (PPHPD). ^ a b "Hajj pilgrims take the metro to Makkah". Railway Gazette International. November 15, 2010. Retrieved 2014-05-08. ^ a b c d e f "Hajj trains shipped to Makkah". Railway Gazette International. May 18, 2010. Retrieved 2014-05-08. ^ Barry, Keith (September 8, 2009). "Take the Monorail to Mecca". Wired. Retrieved 2014-05-08. ^ a b "Operation during Hajj season 1432H (2011 G)" (PDF). Archived from the original (PDF) on February 22, 2014. Retrieved April 1, 2014. ^ "Mecca Metro built by CRCC to be fully operated on Nov. 3". english.crcc.cn/. Retrieved 2011-11-30. ^ "#Serco case study – Makkah Metro". 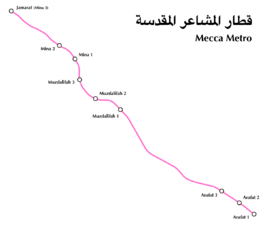 totalrail.org. Retrieved 2012-03-28. ^ "Prasarana to operate Makkah's pilgrim metro". railwaygazette.com. Retrieved 2015-05-15. ^ "Prasarana wins Makkah metro consultancy contract". railwaygazette.com. Retrieved 2014-11-28. ^ a b c d e f "Makkah metro contracts signed". Railway Gazette International. June 24, 2009. Archived from the original on February 28, 2010. Retrieved 2010-02-26. ^ "World rail market March 2009". Railway Gazette International. March 8, 2009. Archived from the original on June 16, 2011. Retrieved March 3, 2010. ^ a b "Knorr-Bremse in Mecca". Railways Africa. July 3, 2009. Retrieved 2010-02-27. ^ a b "China to build Mecca monorail". Straits Times. AGENCE FRANCE-PRESSE. February 12, 2009. Archived from the original on March 31, 2009. Retrieved 2010-02-27. ^ An Yang (November 17, 2010). "China to Help CRCC Claim Loss on Mecca Metro Project". CaixinOnline. Retrieved 2014-05-08. ^ John Garnaut (November 16, 2010). "China Inc goes off the rails in Saudi Arabia while building Mecca monorail". The Sydney Morning Herald. Retrieved 2014-05-08. ^ Sharon Lee (May 11, 2009). "CSR Zhuzhou: A Contract of 150 Metro Vehicles Valued RMB 1.1 Billion". Rednet.cn. Retrieved 2010-02-27. This page was last edited on 26 March 2019, at 17:12 (UTC).